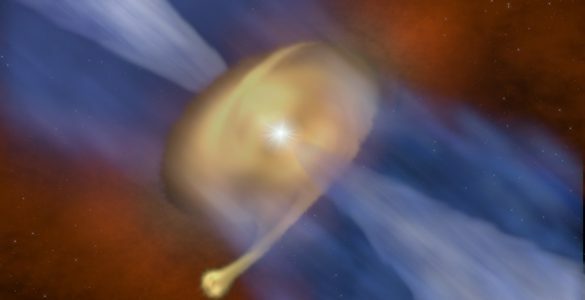 A massive protostar, deeply nestled in its dust-filled stellar nursery, recently roared to life, shining nearly 100 times brighter than before. This outburst, apparently triggered by an avalanche of star-forming gas crashing onto the surface of the star, supports the theory that young stars can undergo intense growth spurts that reshape their surroundings. Astronomers made this discovery by comparing new observations from the Atacama Large Millimeter/submillimeter Array (ALMA) in Chile with earlier observations from the Submillimeter Array (SMA) in Hawaii. In 2008, before the era of ALMA, Hunter and his colleagues used the SMA to observe a small but active portion of the Cat’s Paw Nebula (also known as NGC 6334), a star-forming complex located about 5,500 light-years from Earth in the direction of the southern constellation Scorpius. This nebula is similar in many respects to its more northern cousin, the Orion Nebula, which is also brimming with young stars, star clusters, and dense cores of gas that are on the verge of becoming stars. The Cat’s Paw Nebula, however, is forming stars at a faster rate. The initial SMA observations of this portion of the nebula, dubbed NGC 6334I, revealed what appeared to be a typical protocluster: a dense cloud of dust and gas harboring several still-growing stars. Young stars form in these tightly packed regions when pockets of gas become so dense that they begin to collapse under their own gravity. Over time, disks of dust and gas form around these nascent stars and funnel material onto their surfaces helping them grow. This process, however, may not be entirely slow and steady. Astronomers now believe that young stars can also experience spectacular growth spurts, periods when they rapidly acquire mass by gorging on star-forming gas. 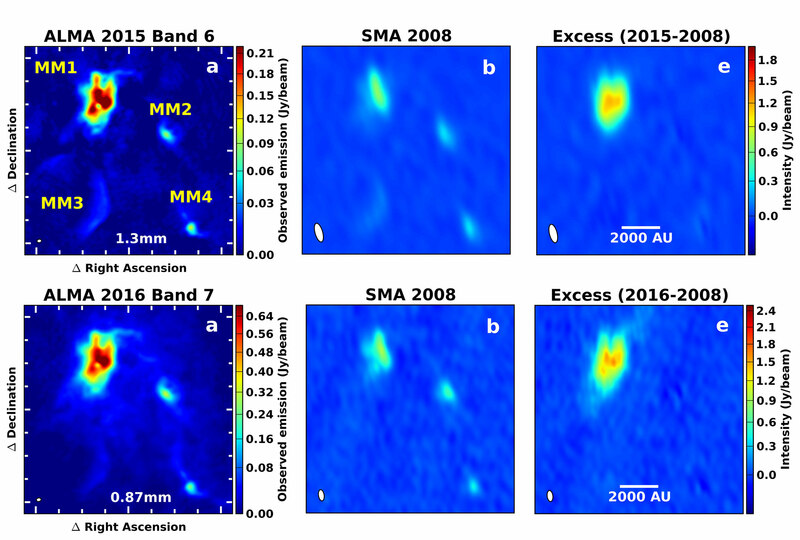 The new ALMA observations of this region, taken in 2015 and 2016, reveal that dramatic changes occurred toward a portion of the protocluster called NGC 6334I-MM1 after the original SMA observations. 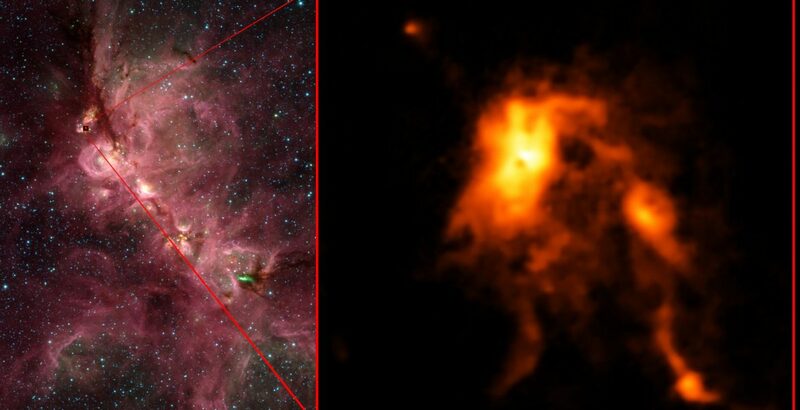 This region is now about four times brighter at millimeter wavelengths, meaning that the central protostar is nearly 100 times more luminous than before. The astronomers speculate that leading up to this outburst, an uncommonly large clump of material was drawn into the star’s accretion disk, creating a logjam of dust and gas. Once enough material accumulated, the logjam burst, releasing an avalanche of gas onto the growing star. This extreme accretion event greatly increased the star’s luminosity, heating its surrounding dust. It’s this hot, glowing dust that the astronomers observed with ALMA. Though similar events have been observed in infrared light, this is the first time that such an event has been identified at millimeter wavelengths. To ensure that the observed changes were not the result of differences in the telescopes or simply a data-processing error, Hunter and his colleagues used the ALMA data as a model to accurately simulate what the SMA — with its more modest capabilities — would have seen if it conducted similar observations in 2015 and 2016. By digitally subtracting the actual 2008 SMA images from the simulated images, the astronomers confirmed that there was indeed a significant and consistent change to one member of the protocluster. 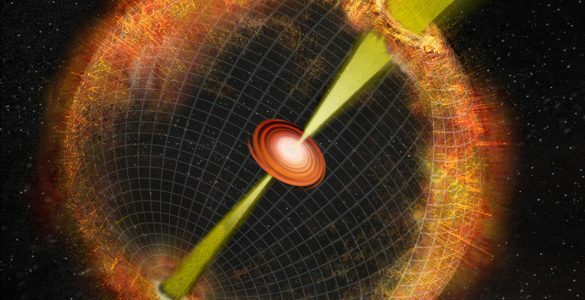 “Once we made sure we were comparing the two sets of observations on an even playing field, we knew that we were witnessing a very special time in the growth of a star,” said Crystal Brogan, also with the NRAO and co-author on the paper. Further confirmation of this event came from complementary data taken by the Hartebeesthoek Radio Astronomy Observatory in South Africa. This single-dish observatory was monitoring the radio signals from masers in the same region. Masers are the naturally occurring cosmic radio equivalent of lasers. They are powered by a variety of energetic processes, including outbursts from rapidly growing stars. The data from the Hartebeesthoek observatory reveal an abrupt and dramatic spike in maser emission from this region in early 2015, only a few months before the first ALMA observation. 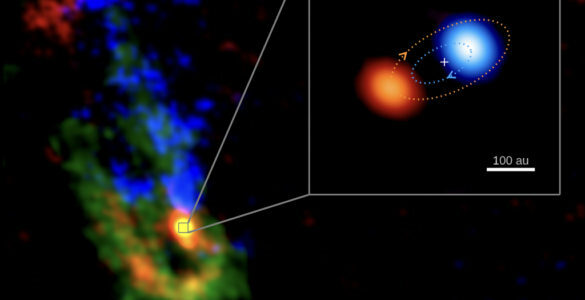 Such a spike is precisely what astronomers would expect to see if there were a protostar undergoing a major growth spurt. The Atacama Large Millimeter/submillimeter Array (ALMA), an international astronomy facility, is a partnership of ESO, the U.S. National Science Foundation (NSF) and the National Institutes of Natural Sciences (NINS) of Japan in cooperation with the Republic of Chile. ALMA is funded by ESO on behalf of its Member States, by NSF in cooperation with the National Research Council of Canada (NRC) and the National Science Council of Taiwan (NSC) and by NINS in cooperation with the Academia Sinica (AS) in Taiwan and the Korea Astronomy and Space Science Institute (KASI). This research is presented in a paper titled “An extraordinary outburst in the massive protostellar system NGC6334I-MM1: Quadrupling of the millimeter continuum,” by T.R. Hunter et al., published in the Astrophysical Journal Letters [https://doi.org/10.3847/2041-8213/aa5d0e]. 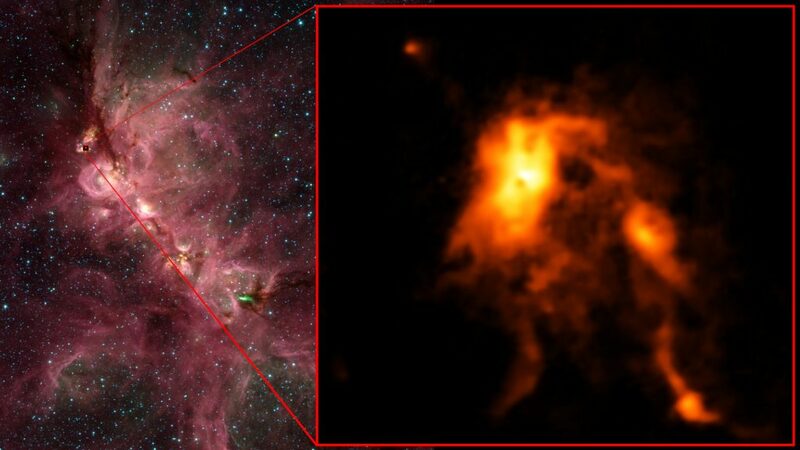 Inside the Cats's Paw Nebula, as seen in an infrared image from NASA's Spitzer Space Telescope (left), ALMA discovered that an infant star is undergoing an intense growth spurt, shining nearly 100 brighter than before and reshaping its stellar nursery (right). 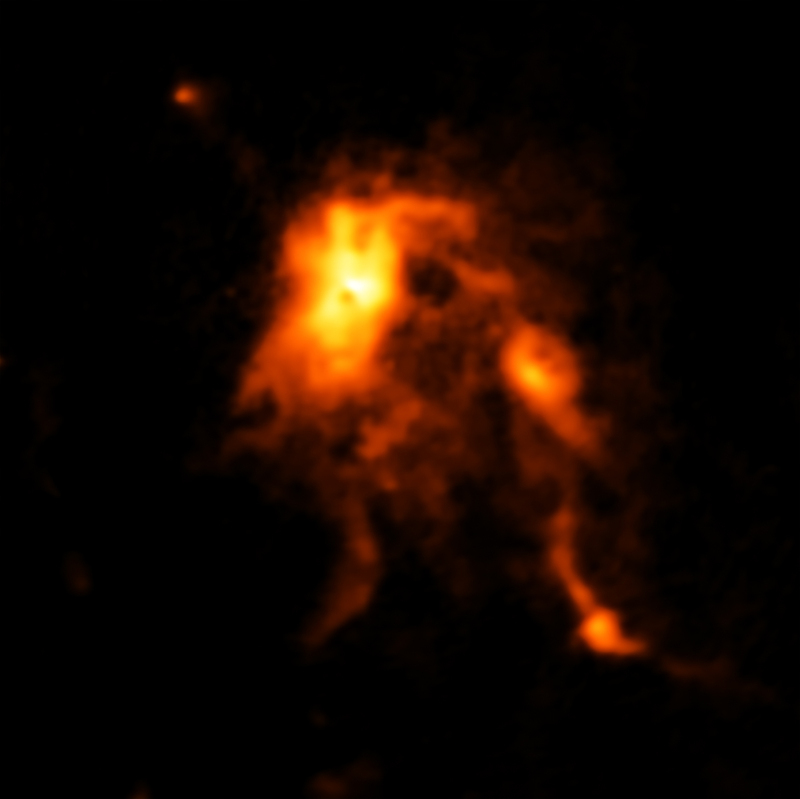 ALMA image of the glowing dust inside NGC 6334I, a protocluster containing an infant star that is undergoing an intense growth spurt, likely triggered by an avalanche of gas falling onto its surface. Comparing observations by two different millimeter-wavelength telescopes, ALMA and the SMA, astronomers noted a massive outburst in a star-forming cloud. Because the ALMA images are more sensitive and show finer detail, it was possible to use them to simulate what the SMA could have seen in 2015 and 2016. 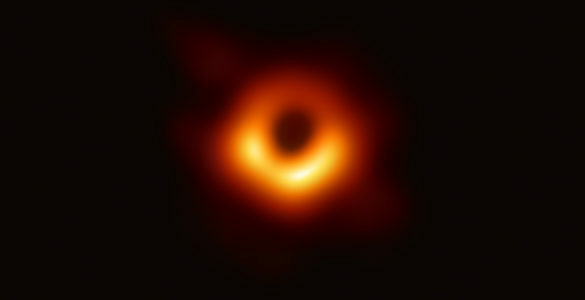 By subtracting the earlier SMA images from the simulated images, astronomers could see that a significant change had taken placein MM1 while the other three millimeter sources (MM2, MM3, and MM4) are unchanged. 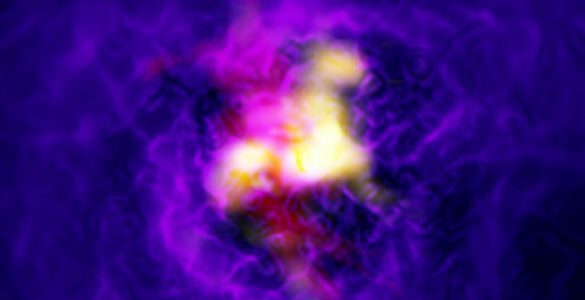 Astronomers have studied a perplexing cosmic blast with a worldwide collection of telescopes, including ALMA and the VLA, but still are not sure exactly what it is. 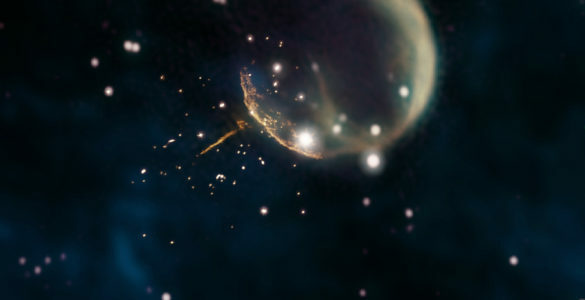 VLA image shows the trail of a speeding pulsar pointing directly back at the center of the debris shell from the supernova explosion that created it. 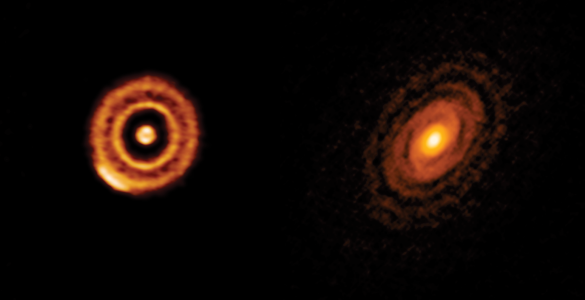 ALMA has detected a star in a binary system that may have formed like a planet. ALMA has conducted a survey of protoplanetary disks, the planet-forming dust belts around young stars.